The end of August, which often seems synonymous with the end of summer, evokes an entire spectrum of emotion, from sweet to bitter. Birders, however, approach that wistful moment with more excitement than, say, school children. The end of August signals the beginning of another great global migratory movement. I’d trade local sweet corn for that! This weekend, I thrilled to the wail of an Eastern Screech Owl in my neighbor’s yard; maybe I should become better friends with those neighbors in case the owl returns. Corey enjoyed shorebirds on the beach in the Rockaways, in the mud at Jamaica Bay Wildlife Wildlife, and on pavement at Floyd Bennett Field this weekend. 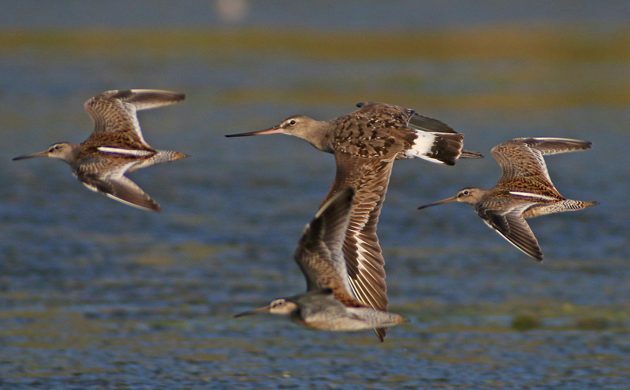 But of all the shorebirds he saw he appreciated none so much as the Hudsonian Godwit he spotted on the East Pond at Jamaica Bay. Godwits are awesome and seeing a year bird is always welcome.